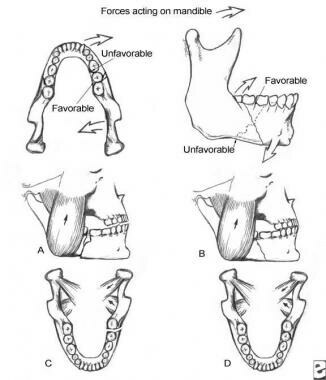 Fractures of the mandibular body may be classified by anatomic location, condition and position of teeth relative to the fracture, favorableness, or type. Body fractures occur between the distal aspect of the canines and a hypothetical line corresponding to the anterior attachment of the masseter. These fractures are proximal to the third molar. Body fractures often are unfavorable because of the actions of the masseter, temporalis, and medial pterygoid muscles, which distract the proximal segment superomedially. Additionally, the mylohyoid muscle and anterior belly of the digastric muscle may contribute to the unfavorable nature of this fracture by displacing the fractured segment posteriorly and inferiorly. For patient education resources, see the Back, Ribs, Neck, and Head Center, Breaks, Fractures, and Dislocations Center, and Teeth and Mouth Center, as well as Broken Jaw and Broken or Knocked-out Teeth. The image below depicts the vertical and horizontal forces acting on the mandible, as well as the relationship of muscle pull to fracture angulation. Forces acting on the mandible and demonstration of the relationship between muscle pulls and fracture angulation. (A) Horizontally unfavorable. (B) Horizontally favorable. (C) Vertically unfavorable. (D) Vertically favorable. In general, mandible fractures of the body, condyle, and angle have nearly the same incidence, while fractures of the ramus and coronoid process are rare. The literature suggests the following mean frequency percentages based on location: body (29%), condyle (26%), angle (25%), symphysis (17%), ramus (4%), and coronoid process (1%). The mandible is involved in 70% of patients with facial fractures. The number of mandible fractures per patient ranges from 1.5-1.8. Approximately 50% of patients with a mandible fracture have more than 1 fracture. Vehicular accidents and assaults are the primary causes of mandibular fractures worldwide. The mandible fracture patterns of a suburban trauma center found that violent crimes such as assault and gunshot wounds accounted for the majority of fractures (50%), while motor vehicle accidents were less likely (29%). Assault most often causes mandible angle fractures. Optimal mandible function requires maintenance of normal anatomic shape and stiffness (ie, resistance to deformation under load). Normal occlusion can be defined when the mesiolabial cusp of the maxillary first molar approximates the buccal groove of the mandibular first molar. Fractures result secondary to mechanical overload. Torque results in spiral fractures, avulsion in transverse fractures, bending in short oblique fractures, and compression in impaction and higher comminution. A fracture in which one cortex of the bone is broken while the other cortex is bent is termed a greenstick fracture. Degree of fragmentation depends upon energy stored as a result of overload prior to the fracturing process. Therefore, wedge and multifragmentary fractures are associated with high-energy release. Obtain a thorough history specific to preexisting systemic bone disease, neoplasia, arthritis, collagen vascular disorders, and temporomandibular joint (TMJ) dysfunction. Knowledge of the type and direction of the causative traumatic force helps determine the nature of injury. For example, motor vehicle accidents (MVAs) have a larger associated magnitude of force than assaults. As a result, a patient who has experienced an MVA most often sustains multiple, compound, comminuted mandibular fractures, whereas a patient hit by a fist may sustain a single, simple, nondisplaced fracture. Knowing the direction of force and the object associated with the fracture also assists the clinician in diagnosing additional fractures. Pertinent physical findings are limited to the injury site. Change in occlusion may be evident on physical examination. Any change in occlusion is highly suggestive of mandibular fracture. Ask the patient how his or her bite feels. Posttraumatic premature posterior dental contact (anterior open bite) and retrognathic occlusion may result from an angle fracture. Unilateral open bite is associated with a unilateral angle fracture. Anesthesia, paresthesia, or dysesthesia of the lower lip may be evident. Most nondisplaced mandible fractures are not associated with changes in lower lip sensation; however, displaced fractures distal to the mandibular foramen (in the distribution of the inferior alveolar nerve) may exhibit these findings. Change in facial contour or loss of external mandibular form may indicate mandibular fracture. A body fracture may cause the lateral aspect of the face to appear flattened. Loss of the mandibular body on palpation may be due to an unfavorable fracture. The anterior face may be displaced forward, causing elongation. In this case, the anterior mandible is displaced downward. Damage to the condylar growth center can cause retarded growth of the mandible and facial asymmetry in children. Lacerations, hematoma, and ecchymosis are associated with mandibular fractures. Lacerations may provide diagnostic evidence of the type of fracture sustained. Hematoma and ecchymosis may alert the clinician to a mandibular fracture. Do not close facial lacerations before treating underlying fractures. Ecchymosis in the floor of the mouth is a diagnostic sign of a mandibular body or symphysis fracture. Pain, swelling, redness, and localized heat are signs of inflammation evident in primary trauma. Use the simplest means possible to reduce and fixate a mandibular fracture. Because open reduction carries an increased morbidity risk, use closed techniques whenever possible. Indications for closed reduction include (1) nondisplaced favorable fractures, (2) grossly comminuted fractures, (3) edentulous fractures (using a mandibular prosthesis), (4) fractures in children with developing dentition, and (5) coronoid and condylar fractures. Indications for open reduction include (1) displaced unfavorable angle, body, or parasymphyseal fractures, (2) multiple facial fractures, (3) bilateral displaced condylar fractures, and (4) fractures of an edentulous mandible (with severe displacement of fracture fragments in an effort to reestablish mandible continuity). The body or horizontal ramus of the mandible usually includes the third molar and is bounded anatomically from the distal symphysis to a line coinciding with the alveolar border of the masseter muscle. Evaluate and monitor patients' general physical conditions prior to treating mandibular fractures. Any force capable of causing a mandibular fracture also may injure other organ systems. Case reports have documented concurrent posttraumatic thrombotic occlusion of the internal carotid artery and basilar skull fractures. Bilateral cervical subcutaneous emphysema, pneumothorax, pneumomediastinum, and spleen lacerations also have been associated with mandible fractures after trauma. Patients should not undergo surgical reduction of mandible fractures until these issues are addressed. Pektas ZO, Bayram B, Balcik C, Develi T, Uckan S. Effects of different mandibular fracture patterns on the stability of miniplate screw fixation in angle mandibular fractures. Int J Oral Maxillofac Surg. 2012 Mar. 41(3):339-43. [Medline]. Lin FY, Wu CI, Cheng HT. Mandibular Fracture Patterns at a Medical Center in Central Taiwan: A 3-Year Epidemiological Review. Medicine (Baltimore). 2017 Dec. 96 (51):e9333. [Medline]. [Full Text]. Boffano P, Roccia F, Zavattero E, et al. European Maxillofacial Trauma (EURMAT) in children: a multicenter and prospective study. Oral Surg Oral Med Oral Pathol Oral Radiol. 2015 May. 119 (5):499-504. [Medline]. Dodson TB. Third molars may double the risk of an angle fracture of the mandible. Evid Based Dent. 2004. 5(3):78. [Medline]. de Medeiros RC, Sigua EA, Navarro P, Olate S, Albergaria Barbosa JR. In Vitro Mechanical Analysis of Different Techniques of Internal Fixation of Combined Mandibular Angle and Body Fractures. J Oral Maxillofac Surg. 2016 Apr. 74 (4):778-85. [Medline]. Barry RG, Wolbert TT, Gress TW, Ray PD, Mozaffari FB. Outcomes After Open Reduction With Internal Fixation of Mandible Fractures. J Craniofac Surg. 2018 Mar 30. [Medline]. Sadhwani BS, Anchlia S. Conventional 2.0 mm miniplates versus 3-D plates in mandibular fractures. Ann Maxillofac Surg. 2013 Jul. 3(2):154-9. [Medline]. [Full Text]. Kuriakose MA, Fardy M, Sirikumara M, et al. A comparative review of 266 mandibular fractures with internal fixation using rigid (AO/ASIF) plates or mini-plates. Br J Oral Maxillofac Surg. 1996 Aug. 34(4):315-21. [Medline]. Ellis E 3rd, Price C. Treatment protocol for fractures of the atrophic mandible. J Oral Maxillofac Surg. 2008 Mar. 66(3):421-35. [Medline]. Aulakh KK, Gumber TK, Sandhu S. Prognosis of teeth in the line of jaw fractures. Dent Traumatol. 2017 Apr. 33 (2):126-32. [Medline]. Katakura A, Shibahara T, Noma H, et al. Material analysis of AO plate fracture cases. J Oral Maxillofac Surg. 2004 Mar. 62(3):348-52. [Medline]. Luhr HG, Hausmann DF. [Results of compression osteosynthesis with intraoral approach in 922 mandibular fractures]. Fortschr Kiefer Gesichtschir. 1996. 41:77-80. [Medline]. Orabona GD, Abbate V, D'Amato S, Romano A, Iaconetta G. Surgical sequence of reduction in double mandibular fractures treatment. Ann Ital Chir. 2014 May-Jun. 85 (3):207-13. [Medline]. Burm JS, Hansen JE. The use of microplates for internal fixation of mandibular fractures. Plast Reconstr Surg. 2010 May. 125(5):1485-92. [Medline]. Alpert B, Engelstad M, Kushner GM. Invited review: small versus large plate fixation of mandibular fractures. J Craniomaxillofac Trauma. 1999 Fall. 5(3):33-9; discussion 40. [Medline]. Barber HD, Woodbury SC, Silverstein KE. Mandibular fractures. Oral and Maxillofacial Trauma. Philadelphia, Pa: WB Saunders Co; 1991. 473-526. Collins CP, Pirinjian-Leonard G, Tolas A, et al. A prospective randomized clinical trial comparing 2.0-mm locking plates to 2.0-mm standard plates in treatment of mandible fractures. J Oral Maxillofac Surg. 2004 Nov. 62(11):1392-5. [Medline]. Gardner KE, Aragon SB. The mandibular fracture. ENT Secrets. Philadelphia, Pa: Hanley & Belfus; 1996. 302-309. King RE, Scianna JM, Petruzzelli GJ. Mandible fracture patterns: a suburban trauma center experience. Am J Otolaryngol. 2004 Sep-Oct. 25(5):301-7. [Medline]. Lazow SK. The mandible fracture: a treatment protocol. J Craniomaxillofac Trauma. 1996 Summer. 2(2):24-30. [Medline]. Schilli W, Stoll P, Bahr W. Mandibular fractures. Manual of Internal Fixation. New York, NY: Springer-Verlag; 1990. 65-80. Spiessel B. The stability principle. Internal Fixation of the Mandible: A Manual of AO/ASIF Principle. New York, NY: Springer-Verlag; 1989. 30-45. A mandible body fracture with displacement. (A) Transverse fracture of the right mandible. (B) Fixation achieved using miniplates at the superior and inferior borders. (C) Postoperative radiograph demonstrating fixation. (A) An oblique fracture of the body fixed with 1 lag screw, in combination with a compression plate at the inferior border and a dental splint for tension. (B) A fracture of the mandible body with a basal triangle. (C) Open reduction and adequate fixation using a miniplate at the superior border and a reconstruction plate at the inferior border. (D) Postoperative radiograph demonstrating fixation. An open hole in the reconstruction plate lies between the triangle and the corpus. Disclosure: Serve(d) as a speaker or a member of a speakers bureau for: Spirox, LLC.